Bright Star is from a design by Renn Tolman of Homer, Alaska. 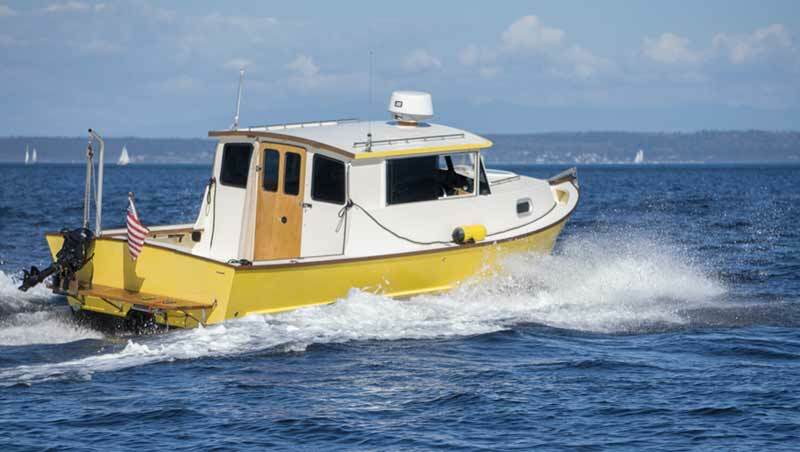 The Alaskan Skiffs began as 18′ open skiffs, built to do well in Alaskan waters, for fishing. They have more recently been customized to be just what the builders want in a boat. Renn Tolman’s basic design evolved, and a few have been built at 26′. Most of the cabin boats are 22′-24′ long, and home-built by the people who plan to use them. Bright Star is a Jumbo 24. As are all the Tolman boats, she’s a plywood “”stitch-and-glue”” wooden boat. Ray built her on our backporch. It took 2.5 years, from delivery of plywood to launching, and we customized ours as a cabin cruiser, for cruising and fishing. The boat is powered by a Cummins diesel MerCruiser 1.7L, 120hp, inboard/outboard. Cruising speed is 18 knots and cruising weight is 3800 pounds. The boat is light for its size, and is easy to tow. We get great fuel economy. With two 36-gallon tanks, we have a range of 300 miles, at speed. So far, we have 6000 statute miles under our keel. Local area cruising has been in the Willamette and Columbia Rivers. Having a trailerable boat allows us freedom easily to go farther, and to enjoy salt water cruising in Washington and BC. We’ve explored the South Sound area between Olympia and Seattle, and spent time in the San Juans, Gulf Islands and beyond. Pre-Festival, we like being in Deer Harbor for the Wooden Boat Rendezvous. Post-Festival cruises with more excitement have been to the Broughton Archipelago, off the far NE end of Vancouver Island (Bright Star crossed to Victoria on board the ferry Coho), and going out the Strait of Juan de Fuca, hanging a right, and cruising northwest along the outside of Vancouver Island up to Brooke Peninsula. Note that we’ve so far managed to avoid going around Cape Scott, and transiting the Johnstone Strait. Next time, a circumnavigation?